Tuesday 29th Jan. Lighting issues. The weather must be warming up as I found myself out in the garage on a school night! Most unusual lately! The side lights on the Red Shed had been bugging me for a little while. A quick check a few weeks back revealed most things working except the side lights, windscreen wipers and dashboard lights. The wipers had already been cured by changing the switch, now it was the turn of the sidelights. I had spare switch in stock, but while this operated the side lights, it wouldn't work the headlights. The switch in the car would operate the headlights, but not the side lights! So, with trepidation, I removed the switch and started carefully stripping it down. Trying to carefully detach all of the small parts so I could see how it all pieced together again was challenging to say the least. Inside the switch is a small rocker assembly. Both of these were full of a gooey green paste which I think used to be grease. All of the small copper pieces were a nice shade of light blue where they had corroded over the years as well. Careful cleaning of these pieces followed and then the arduous task of fitting them all back together began. Once I was satisfied that all were back together properly, I stripped the spare switch down and cleaned that up too. Well, the evening hadn't been wasted in the garage as refitting the switch showed the side lights as now working perfectly. The headlights worked as well, so that's another small job crossed off the MOT list. 26th & 27th Jan. New core plugs and washy time! While the inlet & exhaust manifold were off I took the opportunity of fitting the new superflex throttle arm bush. The old one was absolutely knackered which was making the arm float around and affecting the throttle response. With this done then I then cleaned the block out and fitted the new core plugs. With this done I then refitted the inlet and exhaust manifold and carburettors. I then also decided to refit all of the heater hoses that were missing or knackered when I bought the car. This was going well until the heater hot & cold valve promptly fell apart while I was tightening up the jubilee clip! These are getting to be quite rare, so it could take a while to find one of these. For the mean time I have taken the remainder of the valve off and fitted the heater hoses straight onto the matrix. So the heater (If it works!) will be on hot all the time. I need to find another valve before the summer then! Sunday I managed to get into the garage a bit earlier and the first task was to have a good tidy up. This took some time but I did manage to find a good many tools that I had 'lost' in recent weeks. With this done it was time (and well overdue) to pull Gertie out for a damn good wash. The Essex rally a few weeks back had left her minging, plus she still had the dirt and mud from the Dutch rally under that as well! Two buckets of soapy water were required to get her back she's supposed to look. I don't think I've ever seen her as dirty as she was.) And how on earth did I get mud on the rear windscreen??? With all of this done time was getting on. There's not much else I can do with the Red Shed until some more exhaust parts arrive so I got her up on axle stands for when they do. Due to HRCR noise restrictions I'm going to run a standard exhaust system for the time being. I think I have all the pipes I need, but I'm short on some of the mounting brackets. More ordering to do and more money to spend then! Saturday 19th Jan. The Red Shed gets more attention. The light snow fall that we received Saturday morning meant for a cold day in the garage, so for the first time since I bought it last February, the log burner was fired up. As you can see from the pic below, the log burner also served to dry out spark plugs which had flooded when the Red Shed mysteriously refused to start. All we had done was remove the rear carburettor to fix the broken float chamber and change the water pump to cure the leak, so why wouldn't the sodding thing start? Further inspections began and removal of the rotor arm revealed that the plastic lug that stops it from spinning round was no longer present. The leaking core plug was one of the four that hide behind the inlet and exhaust and the water pipe that runs off of the water pump. So removal of all of this lot was required before I could get to it. Persuading the core plug to leave the engine block was erm....interesting and after much levering, hammering and cussing it did eventually decide to vacate its home that it's been residing in for the past 45 years. There was that much silt and krud behind it that I decided to remove the other three along that side of the block too. The man in the local car spares shop only had three core plugs, so we just flushed the block out with a hosepipe (Once I had unfrozen it!) and have left it for another day. I did want to wash Gertie today as well as she still carries her North Essex dirt from last Sunday. But as you can see, due to the fact it was just too damn cold it never happened. I'll try and get it done before next Friday nights Chelmsford Motor Club Rally. If it isn't cancelled that is. 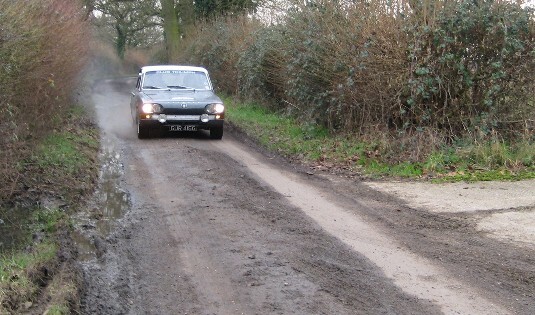 January 13th- Essex Winter Rally. Another early start today and despite the weather warnings the snow hadn't yet made an appearance. A leisurely drive up the A12 saw us arrive in plenty of time for the start. Pretty soon all the other crews and Marshall's had arrived and the pub had opened as well so it was coffee and bacon sandwiches all round. With the map plotted it was time to make tracks. Section one and two wasn't too bad and we felt that we'd done quite well. Section three was a bit trickier and some of the roads were quite good while others were more suited to a Russian tractor! We waited nervously as Mike Banks totalled up the results and then read them out. He does this in reverse order and just recently we haven't had to wait that long to hear our names called out because we've been that crap! However, this time was different. In fact by the time he was up to fourth place and we still hadn't heard our names called I said to Dave "Have you even handed our papers in?" Bit of an early start today. A few friends and I had decided to visit the Historic Rally Car Register open day st Gaydon in Warwickshire. I've been looking at getting into the HRCR scene for a while now, so it made sense to go. We found out quite a bit while we were there about different events all over the country and were impressed by the friendliness of organisers and competitors alike. January 5th- The Red Shed comes to life! The plan for today was the mighty task of awaking 'Red Shed' from her 23 year slumber. This car has been dry stored all that time so no doubt we would find a few surprises along the way. The first job was to knock up a temporary exhaust system so that should she start, she wouldn't turn everyone deaf in the process. Even with this done we still weren't getting any fuel up to the pump so we blasted the airline down the main fuel line only to find that this was blocked solid too. The welding wire performed its task again and once more a blast for the airline cleaned that out as well. We were now getting fuel (Fresh fuel as well) up to the pump but no further. The spare fuel pump robbed from the 10CR/RBRR spares box was fitted, but this was causing us problems too. After rebuilding one good pump out of two we were now getting fuel up to the carburettors. Next on the agenda was to fit a battery and see if we had a spark. Excellent! We did! A very good one at the points, but very hit and miss at number one spark plug. The spark plugs were removed and found that the gap was massive on all of them (I reckon about 60-70 thou!) and the electrodes had all but disappeared! I fitted the old iridium sparks plugs that were in Gertie until recently and then we were sparking when and where we should have been. 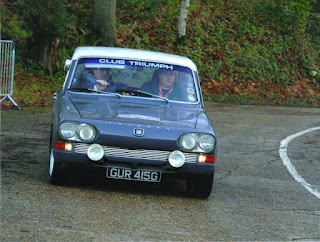 The big moment came, the choke was opened, the key was turned and after a few turns of the engine, she burst into life! A bit too much in fact as she immediately went into full throttle. I quickly cut the engine and then found that the throttle return spring was missing. A temporary one was found and fitted and she was started up again. The engine sounded really sweet. No nasty knocking or banging noises so that was good result. A sticking clutch quickly freed itself and I even managed to move it forward backwards a little bit. removal of the carbs on Sunday showed that the metal clip holding the twin floats had broken off of the carburettor body and the floats were just resting in the bottom of the chamber and therefore not cutting the fuel off when needing to. So a spare carb needs to be sourced along with a better exhaust system and a water pump as well. A quick check of the electrics showed that everything was working with the exception of the windscreen wipers and this only turned out to be the switch which has now been replaced. Rather than sitting around on New Years Day watching crap TV and getting bored senseless, Dave Maton and I decided to take a trip to the Classic car meet at Brooklands in Surrey. The only downside to this was that the New Years evening drinking was somewhat restricted! Leaving my house at an offensive 7am saw me collecting Dave forty minutes later and we made our way round a very empty M25. The only highlight of the journey being a Vauxhall Vectra who's offside front wheel had decided to turn off onto the M40 while the rest of the car continued along the M25! 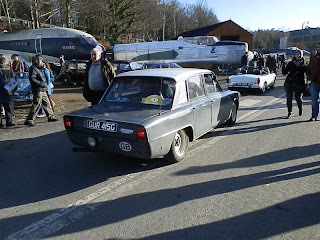 We arrived at Brooklands for when the gates opened at 9am and took our place in the parking for pre 1973 cars. ﻿A little while later we were glad of our early arrival when we heard that the queue to get in was three lanes wide and it was taking around twenty minutes to get through the gates. There were a number of triumphs there amongst all the other classics and we bumped into Dave Lucas and Rob from the Triumph 2000 register and Tim Bancroft and Dave Picton from CT. I was surprised at the number of cars there and apparently this was the biggest turn out the show has had of years. Despite this Dave and I are not really 'show and shine' type car people and by about 1pm we had seen enough and were ready to head home. A busier, but still trouble free drive home saw us back at Dave's in no time and ready for a lovely New Years Day roast dinner.